SuperCloset’s 6-Site Bubble Flow Buckets Hydroponic Grow System grows the biggest and best yields of any bubble buckets system on the market, because it combines the technology of bubble buckets and ebb n’ flow buckets into one fully automated, recirculating hydroponic grow system. Your plants will be so pleased with their new home that they will most definitely reward you for your kindness and good decision making! 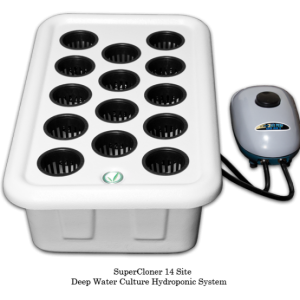 6-Site Bubble Flow Buckets Hydroponic Grow System! We also have a 12-site Bubble Flow Bucket system and a 24-site Bubble Flow Bucket system available. 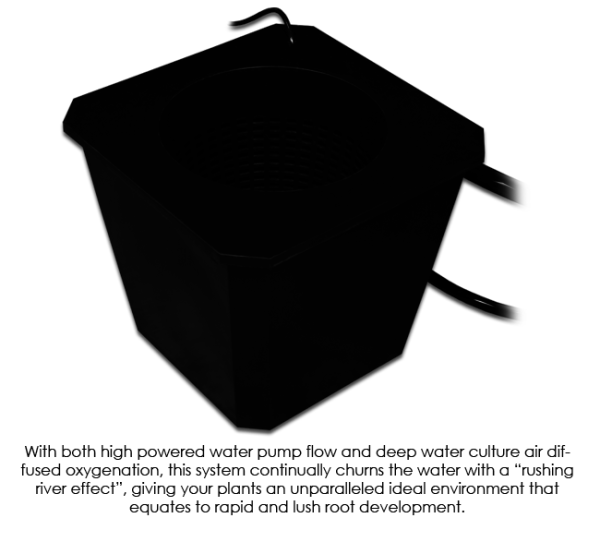 SuperCloset presents 6-Site Bubble Flow Buckets Hydroponic Grow System grow the biggest and best yields of any bubble buckets system on the market, because they combine the technology of bubble buckets and ebb n’ flow buckets into one fully automated, recirculating hydroponic grow system. Typical bubble buckets designs have constant issues with pH and TDS pockets creating potentially perilous micro environments in each bucket. This is due to a lack of circulation throughout the system as a whole. The Bubble Flow Buckets all have the exact same readings due to the addition of the re-circulating ebb n’ flow/up-welling feature. 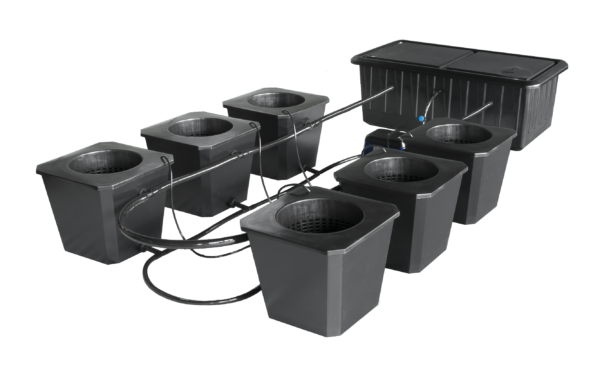 Bubble Flow Buckets therefore have consistent pH and TDS readings and even nutrient distribution throughout the entire system. Bubble Flow Buckets also produce results much more quickly than comparable products due to the hyper-oxygenated environment we have created in each individual bucket. It is a regular root Jacuzzi for each plant. Your plants will be so pleased with their new home that they will most definitely reward you for your kindness and good decision making. 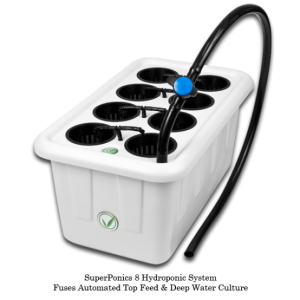 This new 35 Gallon Custom Molded, UV Stable, Food Grade Heavy Duty Plastic Reservoir will provide years of sturdy and stable support for your grows. 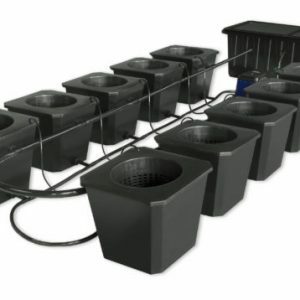 System includes 6 10″ large diameter net pots along with 6 5 gallon Up-Welling, Deep Water Culture Bubble Buckets that are basically creating the equivalent to a day of pampering at the spa for your garden. Every other bush, tree, and shrub on the planet will be green with envy at the treatment your plants receive every day. And your plants will be so grateful that they will bless you with endless bountiful harvests. Eco Plus Pro Air Pumps are the quietest pumps that we have tested, yet still extremely powerful. Commonly used to provide oxygen in aquariums, fish farms, hydroponic systems and more. Solid aluminum body for enhanced durability. Designed to minimize noise and vibration. Oil-less compressor allows for easy maintenance. No lubrication required. 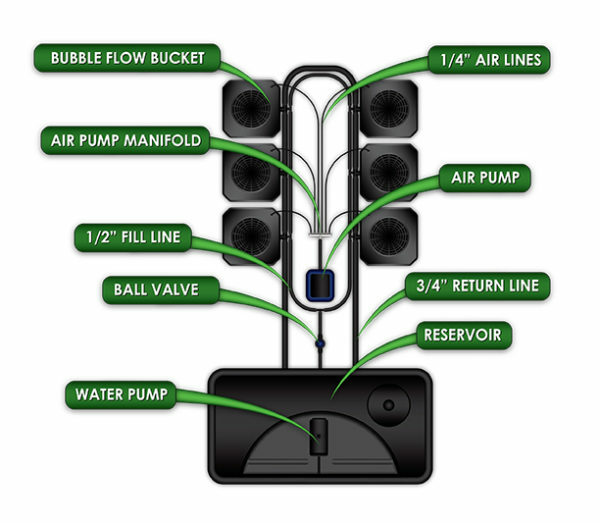 The Eco Series pump is the heart and flow of our unique hydroponic systems. Its powerful, oil free high magnetic rotor, ceramic shaft, and bearing insures reliability and quiet operation. 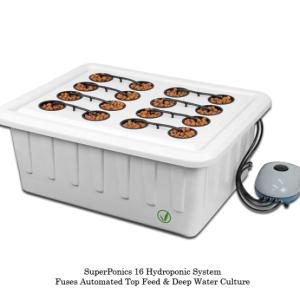 Plug it into its designated timer and you have your own personal robotic gardener making certain that your plants never go thirsty again.